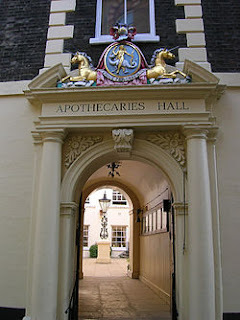 On Thursday 29 June I gave a keynote lecture at the Geoffrey Flavell symposium, held at the Worshipful Society of Apothecaries, in Blackfriars, London. If you haven't visited, do check out the website and learn about the activities of the Society. It is 400 years old, having been founded as a City Livery Company (incorporated by royal charter in 1617); a major centre for the manufacture and sale of drugs at the Hall (1671-1922); the founder of Chelsea Physic Garden (in 1673) and a medical examining and licensing body since 1815. The beautiful building was partly burned down in the Great Fire of London and rebuilt; as an early modernist by training, I was delighted to discover that the symposium itself was being held in the space where Oliver Cromwell's armies had once bedded down for the night. Apparently, they made quite a mess. To get back to the theme of the symposium, Geoffrey Flavell was a highly respected cardio-thoracic surgeon. Born in New Zealand, he completed his training at Bart’s in London. In 1939, he became the resident surgical officer at the Brompton Hospital. And he worked, during the Second World War with Sir Archibald Mcindoe, of Guinea Pig fame, in treating severely burned patients. Flavell was appointed consultant at the London Hospital in 1950, where he worked for 30 years. In keeping with Flavell's specialism, the title of this year's Symposium was ‘The Heart, Health and Culture: An Exploration in Medicine and the Humanities’. It gave me a chance to revisit my earlier work on the history of the heart, in health and disease. 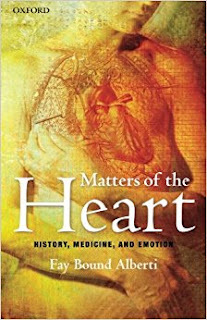 My book Matters of the Heart: History, Medicine and Emotion (Oxford University Press, 2010) explored the meanings of the heart as both symbol and organ. It looked at why we have two very different ideas about the heart in our culture: the heart as a Hallmark symbol sold on millions of cards every year and the heart as a pump, responsible for the circulation of the blood. In my book, and in my paper, my theme was this: for centuries, medical practitioners in the West held the heart to be the centre of emotion, thought and feeling. Before the rise of the brain qua mind, the heart was the most important organ of the body, which was frequently viewed in cardiocentric ways: the heart was all that mattered in the end. With the rise of scientific medicine and neuroscience, the decline of religious explanations for our existence (and the decline of the soul in the material tradition), the heart became a material object. It might beat excitedly when we see a loved one, but not because our soul was moving through the heart. It might feel like our hearts would break, but not because our hearts were overwhelmed by the melancholic humours of the ancient world. Hormones began to offer a new explanation; hormones produced by the new emotional centre of the body: the brain. Of course, the heart still continues to thrive at the level of popular culture. The brain governs emotions in name only. Nor is the brain the only contender for the title of emotional organ par excellence, as my book This Mortal Coil: The Human Body in History and Culture (Oxford University Press, 2016) argues. Other organs – notably the gut – are coming into their own. Like the heart, they are seen as sites of hormone production (and even, more controversially as systems of cellular memory). We are listening to the body more and more, though as we do, we must acknowledge the gaps in scientific medicine; the ways in which narratives of healing are leaving holism behind. These are the themes I talked about at the symposium, reflecting my enduring interests in the history of the body and the history of emotion. How do we explain what we feel, and how has that changed over the centuries? Why are some organs given more importance than others? Why do heartfelt emotions and gut feelings have so much sway? Or really: why shouldn’t they? We feel with our gut and our heart, after all. One of the most fascinating aspects of the symposium for me – a day that brought together historians and theologians, surgeons, GPS and ethicists – was how emotional our attitudes towards the body are, even for surgeons. Making a choice as a transplant specialist for instance - to operate or not operate - involves all the surgeon's clinical training, of course, but it also impacts on his and her emotional experience. Patients are not just bodies, but living, breathing people with families and loved ones. We want surgeons to be coolly efficient, but we also need them to be human. The ways we intellectualise the body in medicine, talk about it, take it apart physically and metaphorically, doesn’t take away from the fact that we exist and experience the world, for good and ill, in our bodies. We feel emotional about what happens to our bodies (and those of our loved ones) just as we did in the past, albeit for different reasons. One of the themes that crosses boundaries between scientists and non-scientists is the question of what makes us quintessentially human. We might talk about the word ‘soul’ (and most of us believe we have one), though there is no agreement on what it is, or what it does. In the 17th-century philosopher Rene Descartes’ time (he of the 'I think therefore I am' doctrine), things were simpler: the soul lurked behind the eyebrows. It was the space where the physical body met the emotional and spiritual body. It was also why so many emotional expressions involved the raising or furrowing of the brows. Today the soul is often placed in the brain (and sometimes seen as synonymous with the mind and consciousness). Far more often it exists as a nebulous, free-floating entity that is, and yet is not, linked to our religious beliefs. Sometimes, the soul is still placed in the heart. When I ask people to point to their minds, more often than not they point at their heads. When I ask them to point to their ‘selves’, they point to their heart. The heart remains an emotional centre, then, and not just in language. 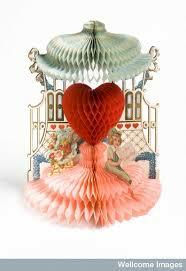 The heart remains a symbol of our inner selves, of truth, of passion. Outside the narrow confines of medical textbooks, it can’t ever be reduced to a pump.